Sake Bar Minneapolis: Come for Happy Hour! Have Happy Hour at Our Sake Bar! 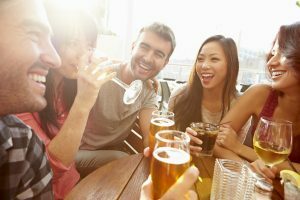 It’s a workplace tradition around the country – the Friday happy hour. You and your coworkers want to celebrate making it through another successful week, and what better way to celebrate than with a round of drinks? However, if you’re tired of going to the same bar or restaurant down the street from the office, shake things up by visiting the sake bar at Moto-i in Minneapolis. We brew our sake on-site, and our servers will gladly explain the brewing process and what your options are. Our restaurant and lounge has plenty of room for large groups, so if your entire floor or department decides to come out for drinks, we’ll have a seat for everyone. If some of you plan on staying for dinner, make a reservation for a table, and we’ll have it ready when you are. We have a full menu of Japanese cuisine, and our staff can make suggestions on which type of sake will be best with each dish. If you have new coworkers, or coworkers who have never had sake or Japanese food before, Moto-i is a great place to introduce them to both and to get to know them better. If you’re looking for a new happy hour spot in Minneapolis, come to our ramen and sake house today. Our happy hour runs every day from 2:20 p.m. until 6:00 pm, and again on Sunday through Thursday from 10:00 p.m. to 2:00 am. Please keep in mind that customers must be over 21 after 9:00 p.m. on Friday and Saturday. We look forward to serving you the very best sake!